San Diego State guard Xavier Thames, center, shoots in front of the McNeese State defense during the first half of an NCAA college basketball game in San Diego, Saturday, Dec. 21, 2013. SAN DIEGO (AP) — Winston Shepard got instant redemption for whatever it was that got him benched Wednesday night by San Diego State coach Steve Fisher. Shepard returned from a one-game suspension to score seven straight points during a 13-0 run midway through the second half that helped the No. 24 Aztecs wake up and pull away from McNeese State for a 65-36 victory Saturday night. Shepard finished with 14 points, and Josh Davis had 12 points and 17 rebounds to help SDSU (9-1) win its eighth straight game. Aqeel Quinn had 12 points and Matt Shrigley 11. 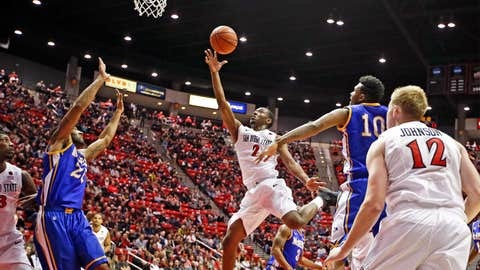 Neither Shepard nor Fisher would say what it was that earned the sophomore forward a spot on the bench in street clothes for SDSU’s 76-39 victory over Southern Utah on Wednesday night. He didn’t start Saturday night but entered the game about five minutes into the first half. "I want to just come out and play as hard as I can," Shepard said. "Sitting out (stinks) but I tried to learn what I can from it. I watched from the sideline and dissected the game different tonight and tried to be more of a team player and hit my teammates." Shepard said sitting out allowed him "to see the game from the side view. Sometimes when you sit out you can sit and pout. I tried to take the good out of a sticky situation, just watching from the side, trying to get my teammates involved, looking to pass a lot more tonight, to get my teammates open and get easy looks for them." Said Fisher: "I thought he’d play the way we expect him to play." Ledrick Eackles scored 13 points for McNeese State (2-9), which is in a stretch of nine games away from home in a span of 46 days. After leading just 21-18 at halftime, the Aztecs finally came to life in the second half. With the Aztecs trailing 25-23, Aqeel Quinn hit a 3-pointer from the left corner, SDSU’s first shot from beyond the arc in 14 tries, to start the 13-0 run with 14:56 to go. Shepard then scored the next seven points, on a free throw, a runner in the lane, a layup and two more free throws. Xavier Thames ended the run with a 3-pointer for a 36-25 lead with 11:28 to go. Shepard added a slam dunk off a missed shot with 8:47 left. "I think a sleeping giant woke up," McNeese State coach Dave Simmons said. "We battled the first half as well as we could play. In my mind, if we had done a couple things, we might have been up a couple points. We battled, the kids played hard. In the first half we did match their intensity, but they went up another level on us and we didn’t match that intensity." Still, the Aztecs finished shooting just 37.3 percent, 22 of 59. They made only seven of 27 3-point shots. Fisher said he almost put in JJ O’Brien, who has an injured hand, but didn’t have to. "When you can’t make a shot, it doesn’t look very pretty, and neither team could make a shot in the first half," Fisher said. "The way we started the second half, I didn’t think we were going to get a shot, with the turnovers that occurred. But finally we made a basket, I think Aqeel made a basket, a 3, and it seemed as it everybody felt a little more relaxed." The Aztecs were lethargic in the first half, making only 7 of 29 shots and missing all 10 3-pointers. SDSU outrebounded the Cowboys just 23-22 in the first 20 minutes. The Cowboys’ last field goal of the first half was a jumper by Adrian Fields with 7:45 left that gave them an 18-17 lead. San Diego State was almost as cold, getting only a basket off a rebound by Davis and two free throws from Shepard the rest of the half.